"He threw his car keys, his credit card, and all the cash he had on hand at my feet." 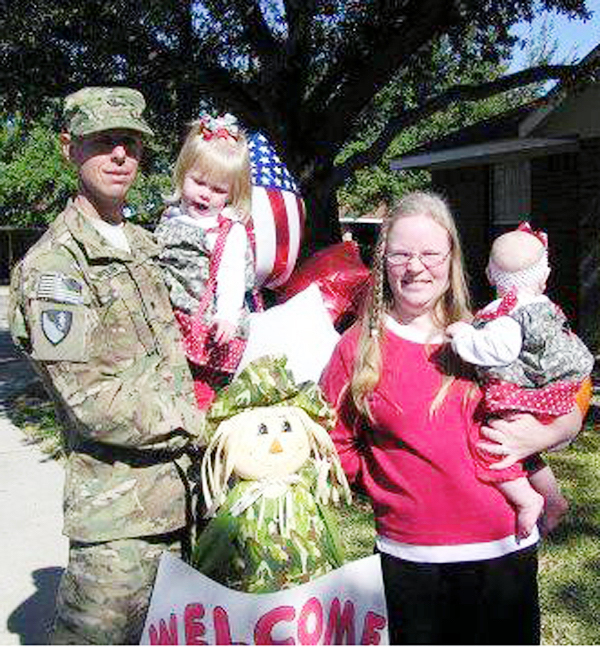 After Army Private First Class Brian Orolin returned from Afghanistan in 2011, everything seemed fine. But as the years went by, his wife, Donna, could tell something wasn’t right. He became paranoid, suffered constant headaches, and would isolate himself in his bedroom with the lights dimmed. Then, on November 19, Brian left his home and family. He’s been missing ever since. At StoryCorps, Donna remembered the day he returned from Afghanistan, and the moments before he disappeared. If anyone has information regarding Brian’s whereabouts, please contact the Montgomery County Sheriff’s Office near Spring, Texas. Originally aired September 5, 2015, on NPR’s Weekend Edition. Photo courtesy of Donna Orolin. DO: He was literally the last person off the plane, and he was just so excited to see his daughters. I dressed the girls up and put little bows in their hair with his unit on ‘em, and I’d put a sign out front that said, ”Welcome Home Specialist Orolin.” He just couldn’t wait to be dad, husband again. But then, things were different. We used to hold hands all the time before he left. When he came back, he didn’t like to be touched. So, I had to remind myself to not rub his back, not sneak up behind him and give him hugs. And pretty much his sense of purpose was gone. He would say that he was just gonna go away somewhere, someday and disappear and we’d never find him. Brian left Wednesday morning, and I always went to church to go to Bible study. Since he had the car, I had called the church to see if someone could take us. Somebody arrived at our house to take myself and my daughters to church, and while they were there, Brian come home. He got very upset that I had people in the house that he didn’t know, and he threw his car keys, his credit card, and all the cash he had on hand at my feet. And, that’s the last I saw him. Our daughters are five and four. They know that Daddy’s not home. They know that the police are looking for Daddy. But sometimes they’ll have memories like, ”Daddy used to bake brownies,” and he’d let the girls crack the eggs and stir the batter. Well the first time I wanted to make brownies, the youngest girl wasn’t sure if that was okay or not. And I had to tell her that us Orolin girls could do anything, and we get through it. If I could tell Brian one thing, I love him and I’ve got this. I’m gonna do what’s best for those girls. I’ve got this.